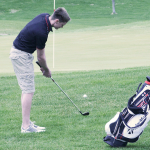 Wolfpack linksters competed at the Plainview Golf Invite which was won by Stanton. The Mustangs carded a 339 followed by West Holt with 354, Randolph 363, Neligh-Oakdale 368, Crofton 369 and EPPJ finished sixth with a 371. Invite medalist was Alex Fritz of West Holt (81). The Wolfpack’s top placer was (finishing 9th) Chad Bode 84. Other Wolfpack scorers were Kyle Heithoff 91, Miles Schrage 93, Regan Kerkman 103 and Kalin Henn 117.